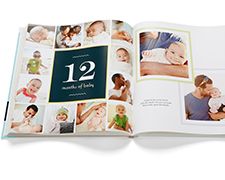 Capture all of baby's moments and milestones in a photo book you can open again and again. 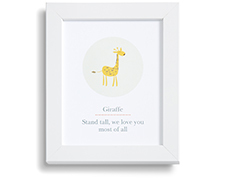 Showcase aww-worthy images in glass-free frames for a perfect nursery accent. Show your baby love in a custom frame that lets you swap out photos as baby grows. Photos of baby make heartwarming gifts they'll hold on to. Share the sweet news with a birth announcement as special as your new arrival. Create the perfect shower invite to celebrate the mom-to-be. 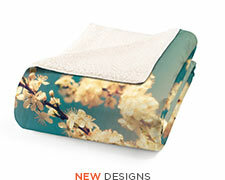 Cozy up with your little one on snuggly soft pillows. 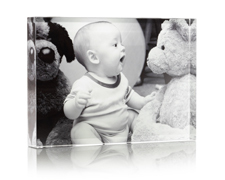 Every photo melts your heart - display five of your favorites in an elegant photo cube that's perfect to give or keep. Sweet photos. Mini masterpieces. 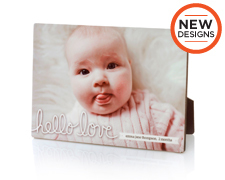 Show off baby's cutest pics with a desktop plaque in a range of designs. Add a precious photo to your phone case to keep it close at hand. Keep baby little a little longer with gallery-wrapped canvas prints. Give your little one the warm fuzzies with cuddle-worthy blankets. 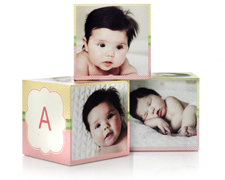 Show off baby's sweetest moments in a stylish, clear photo block. Hold on to all that love with a photo that will stick around. Send your heartfelt gratitude in a thank you card made with love. 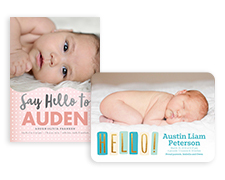 Create one-of-a-kind personalized baby gifts and birth announcements with Shutterfly. 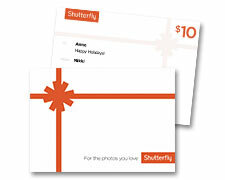 Personalize greeting cards and photo cards with up to 9 digital photos and details of your new bundle of joy. 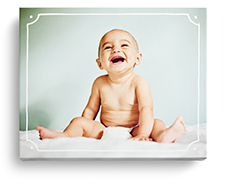 Order custom baby photo books to remember all the milestones in your baby's first year of life. From the first tooth all the way to the first step, you will be able to document it all. Photo gifts and calendars of the newborn also make great gifts for the grandparents in their life. 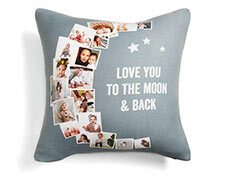 They will be sure to proudly display these personalized baby gifts all around the house. 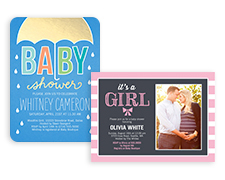 For the mother-to-be, create personalized baby shower invitations to send to family and friends that will help celebrate the new baby on the way. Never forget a moment or milestone with your precious child – you can start building your baby scrapbook today one page at a time. Soon, you’ll have enough pages full of baby memories to fill an entire scrapbook. This is the perfect gift to give to your child when they are older and can look back at when they were just a baby. Looking to decorate the new nursery? 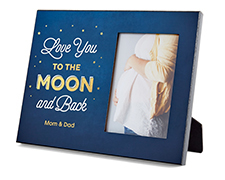 Shutterfly offers personalized wood wall art, custom pillows, plush fleece blankets, and more to display your favorite baby pictures for decor. These unique home décor gifts can showcase the love and happiness of your family. No matter the occasion, there are personalized baby gifts that are just right for you. Discover these custom baby photo ideas and get started on creating memories of your baby today. 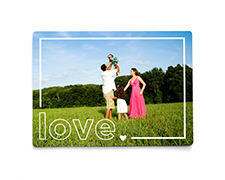 With Shutterfly, you can document every step of your baby’s journey in life. 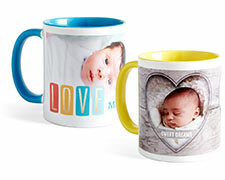 Unique and personalized baby gifts will keep you cherishing these important moments of your child forever.